Mario's Slides in New Super Mario Bros.
Mario's Slides is one of Mario's minigames in Super Mario 64 DS and a variety Minigame in New Super Mario Bros. where the player must draw lines with the Stylus to guide Mario to the Power Star and away from the three Piranha Plants. Its gameplay is similar to another Super Mario 64 DS game, Connect the Characters, and the music is a remix of the minigame theme from Super Mario Bros. 3, which it shares with that minigame. The background in Super Mario 64 DS features two cliffs in a night sky, but is different in New Super Mario Bros., instead using a background similar to that of an underground level. Guide Mario down the slides to the Star. 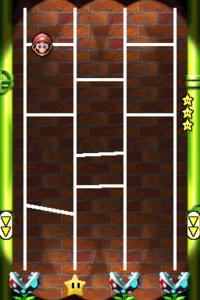 Draw lines on the Touch Screen to create new routes for him. If Mario lands in a Piranha Plant, it's game over! Collect five Stars to move up a stage. Amidasu From amidakuji, a traditional Japanese style of lottery. Sadari tagi The Korean name of amidakuji. This page was last edited on April 3, 2019, at 08:22.